João Rodrigues - Portuguese Classical Saxophonist from Coimbra, Portugal. 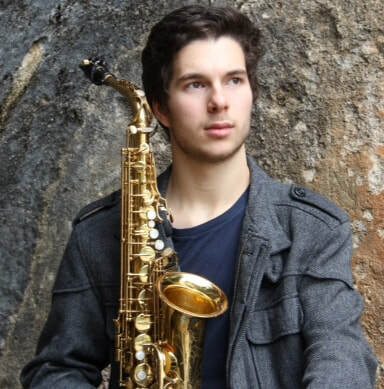 João started learning Saxophone at the age of 9 and finished his secondary studies at the Coimbra National Conservatory (Conservatório de Música de Coimbra) with his saxophone teacher, Paulo Almeida. In 2017, he was admitted to the Conservatorium Maastricht, in the Netherlands. There he is currently studying classical saxophone with his two teachers Eva van Grinsven and Jean-Pierre Cnoops. During his study years he participated in several masterclasses by some of the most renowned saxophone players in the world such as Arno Bornkamp, Otis Murphy, João Pedro Silva, Marcus Weiss, Luís Ribeiro and Femke IJlstra. He also participated in some national wood instrument competitions and has integrated so far several music projects where he has had the opportunity to play with professional musicians and gather stage experience playing solo as well as with orchestras.